Reason for Watching: Vaguely I remembered seeing it when it came out, and thinking it mediocre. Since then I’ve heard the soundtrack and loved it, being as it is by James Newton Howard, and wanted to give the rest of the movie another chance. Movie Re-watchability: While not among the great Disney classics, this is still a movie I would readily watch again, primarily for the beauty and energy of the animation itself. Director Re-watchability: Trousdale and Wise also directed Disney’s Beauty and the Beast, which is among the great Disney classics. My guess is, these guys are re-watchable. Recommendation: If you’ve the slightest interest, it is worth a watch. It won’t emotionally affect you, or leave you with deep thoughts to think afterward, but it does an excellent job of entertaining. It’s refreshing to watch a movie with a lean hour-and-a-half run time. While I have a soft spot for true epics—like Spartacus, Lawrence of Arabia, Gandhi, The Lord of the Rings—today’s casual movies have grown bloated and overlong, often taking two-and-a-half hours to tell a ninety minute story. Atlantis: The Lost Empire does not overstay its welcome; rather, it takes you on a quick and bumpy adventure where the sights and thrills are delivered with polish and professionalism. If the plot has gaping holes (which it does), and the story lacks depth (ditto), we forgive them because the animation is beautiful and energetic and the characters are fun. Of course, she's a few thousand years old, but is that really relevant? Milo Thatch is the perfect Hollywood hero-nerd: conventionally slender and handsome, wears glasses, is an absent-minded but otherwise brilliant professor (in all but title), smiles a lot and sometimes goofily, is clumsy in a manner both endearing and startlingly destructive, likes to ramble quickly about arcane matters which bore everyone else to tears, and in the end gets the exotically gorgeous magical princess. And has the minor triumph of discovering a lost magical civilization, thus justifying all his years of esoteric research and theories. Gosh, I’m so close to being him, so close. I just need some good looks, a princess, and success! Milo: Will you look at the size of this? It’s gotta be half a mile high, at least. It-It must have taken hundred- No, thousands of years to carve this thing. What enlivens the movie apart from its fast pace are the sharply-drawn cast and their snappy dialogue. Everyone’s role is predictable and clichéd, but I smiled at the artifices and relaxed because the protagonists are so likable and the villains appropriately charismatic. The voice-actors are all well cast, and even the celebrities like Michael J. Fox and Leonard Nimoy add to their characters rather than distract from them. 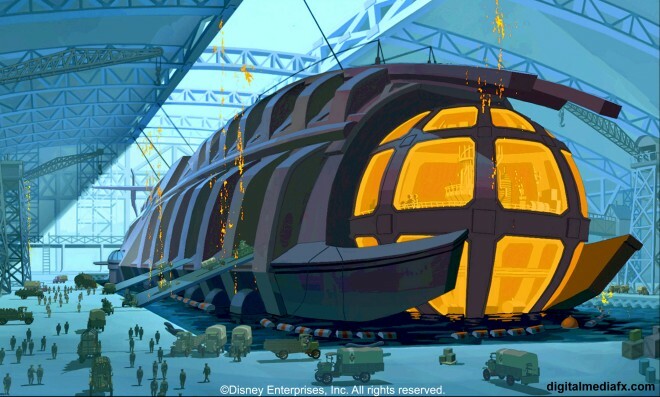 Vinny Santorini, the demolitions expert voiced by Don Novello, is my favorite, with the quip above, and this one after seeing the Atlantean flying vehicles that are designed like fish: “You got something sporty? You know, like a tuna?” Everyone gets some fun dialogue. It’s not Joss Whedon (or maybe it is, since he is one of seven credited writers), but it’s a bit more innovative and energetic than your standard Hollywood fare, or even your standard animated fare. I like the whole design aesthetic, too. The movie is set in 1914, and features a truly nifty Jules Verne-inspired submarine. The scale of the underwater scenes is impressive, with massive sea creatures (actually magic robots built by the Atlanteans) guarding the abyssal caverns that lead circuitously to the hidden city. Our heroes move through these awesome locales by a series of dangerous events and little time for rest or reflection. It’s pure pulp adventure, and lots of fun. 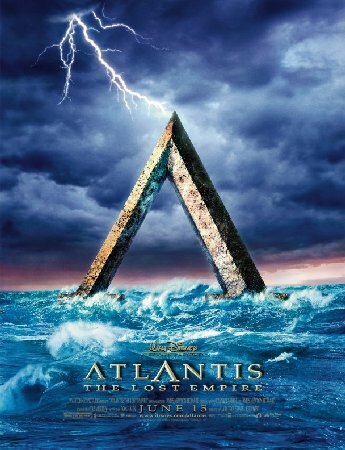 My main complaint boils down to the fact that Atlantis: The Lost Empire features too little of Atlantis itself. The only scenes that take place in the city proper are in the King’s courtyard or a place or two at its outskirts. I wanted to explore the island, its culture, and the ways the Atlanteans have survived the millennia. Exciting glimpses are given to us by the design team: a towering central mountain ringed with Mayincatec-style buildings, lush terraces, and stone vehicles that fly by magic. But the plot itself is all about explorers and their loyalties/greed/self-respect, and has little to do with Atlantis or its wonders. Relatively few of the legendary people are actually seen, despite our heroes frequently walking through the bustling city’s center, and none beyond Princess Kida and the King have any dialogue or personality. To be fair, it makes sense that Atlantis would have a small population; we are told that they have lifespans of hundreds of years, and with only one underwater island on which to live probably do not reproduce much (although some children are seen). Still, Atlantis is all artwork and no personality. After all, at one time the built robots like this. Some other elements annoyed me. For instance, the mercenaries take over Atlantis far too easily. The Atlanteans are shown with some weapons, and Kida clearly has lightning quick reflexes and a willingness to kill; after the mercenaries reveal their violent purpose, she jumps on one of them and whips out a knife, and is only prevented from slitting his throat by Commander Rourke shooting the knife out of her hand. And yet the mercenaries are able to walk through Atlantis with guns displayed, the princess captive, with apparently no one noticing until they get to the king’s dais. I’d expect Atlantis to have an army. An army with flying vehicles. Kida couldn’t get her vehicle to work because she misunderstood one little part of the instructions. Ergo, the flying vehicles are not disabled, and Atlantis likely has a defense army that can use them. So where are they? Seek, and ye shall find the Big A. 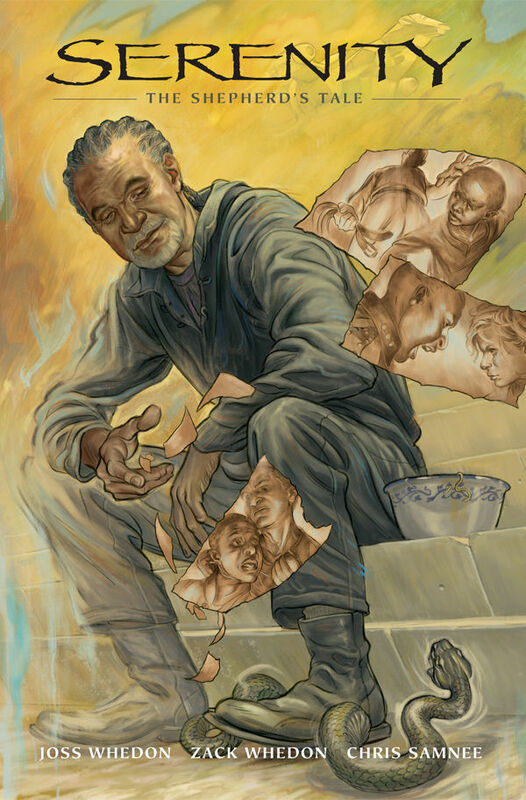 Also, no good reason is given for why the Atlanteans themselves have not found the Heart which powers them. Rourke finds it so easily: in the pond before the king’s throne is a symbol, and if you stand in the center of the symbol, the ground lowers like an elevator to take you to the floating Heart of Atlantis. Are we to believe that in ten thousand years no Atlantean ever stood on that spot, even by accident? And how could they forget such an important detail of their city’s livelihood? Must they be that dumb? And speaking of that, why is it so easy to get to after all? It’s barely hidden at all. But these complaints are ultimately inconsequential, belonging as they do to some other, more serious, movie in my imagination. True, I may have preferred a more deeply mythical atmosphere, like Hayao Miyazaki might have given it, to the slapstick gags that the Disney company loves so much. But that’s not what the filmmakers chose to make. Instead, Atlantis: The Lost Empire is a fast-paced kids’ adventure with beautiful animation and a happy helping of wit and personality.